“Wooster’s Fossil of the Week” is not always about actual fossils, but our topics are each paleontological. 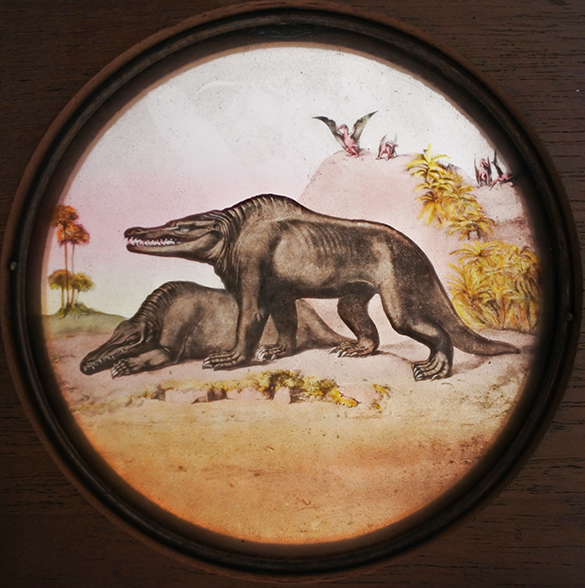 Many years ago I discovered in an old box tucked away in the attic of Scovel Hall at Wooster a set of “Magic Lantern Slides” used in geology courses. I came across them again recently and thought I would share these ancient scenes. Lantern slides were the 19th Century equivalent of PowerPoint, so generations of Wooster geology students must have sat in rapture looking at these colorful images. (At least that’s how I imagine them now viewing my PowerPoint slides!) The above imagined seashore view includes the crocodylian Teleosaurus atop the layered rocks, Ichthyosaurus immediately below, four long-necked Plesiosaurus on the left, an orange cluster of the crinoid Pentacrinus rooted inexplicably in the beach sand, and a scattering of ammonite and oyster shells. The caption on the image says these animals lived during “the Secondary Epoch of the Earth’s history”. We would now say this is a Jurassic scene. 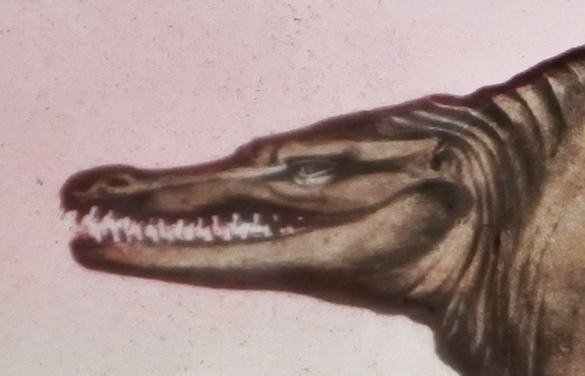 The ichthyosaur looks the most odd to us. Not only is it crawling on the land, it lacks a dorsal fin and the characteristic bi-lobed, shark-like tail. 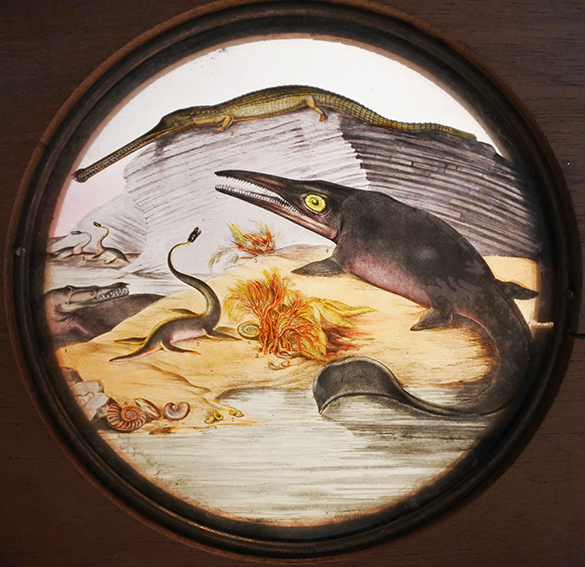 These were later discoveries about ichthyosaurs made only after specimens were found with skin impressions. This close-up shows the detail in these images. Ammonites are on the left (“6”) and the oyster Gryphaea is on the right (“7”). 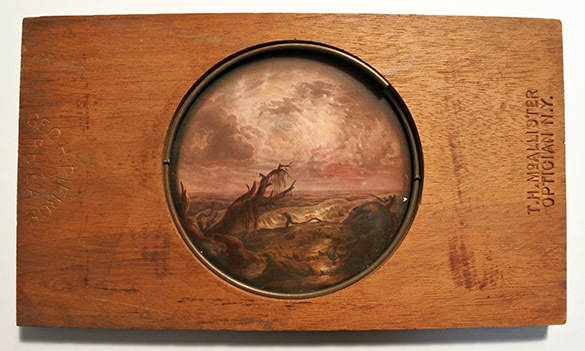 The Magic Lantern Slides are 4×8 inches with the image on glass fixed in a thin slab of wood with metal rings. These are chromolithograph slides, each stamped “T.H. McAllister, Optician, N.Y.”. 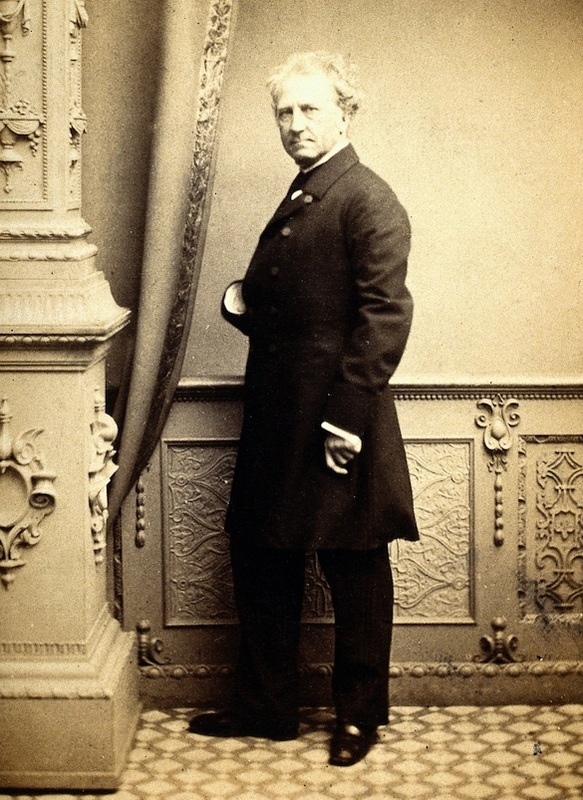 McAllister was the most prominent of many American producers of lantern slides in the late 19th century. The quadrupedal beasts in the foreground are the of the Jurassic theropod dinosaur Megalosaurus, with pterodactyls in the background. We now know Megalosaurus was bipedal, like all theropod dinosaurs. Another detail showing the fine quality of these color images on glass. 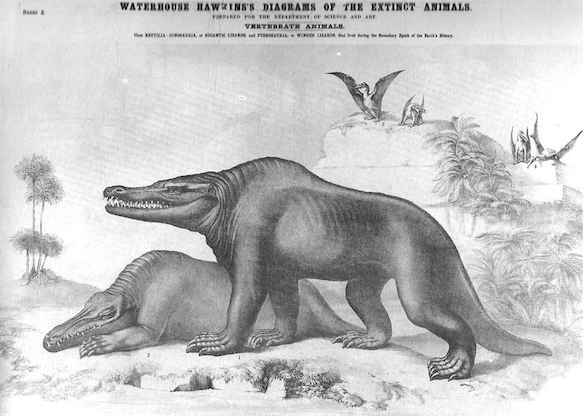 Most readers with any background in the history of paleontology recognize these reconstructions of ancient life from the work of Benjamin Waterhouse Hawkins (1807-1894). In 1855, Waterhouse Hawkins finished sculpting life-sized models of these extinct animals, along with many others, for the Crystal Palace gardens in London. He was advised for the anatomical details by Sir Richard Owen (1804-1892), a hero of paleontology but not a fan of Darwinian evolution. He is responsible for the dinosaurs of Waterhouse Hawkins looking rather mammalian. Most of these extraordinary animal statues still exist. Benjamin Waterhouse Hawkins (1807-1894). More reconstructions from him, along with his brief biography, in the next installment.